Take I-85 North. Exit off I-85 at the Wire Road, Hwy 80, Exit #42. Turn right at the end of the exit onto Hwy 80 East/South (towards Phenix City, AL). Travel approximately 16 miles to the intersection of Hwy 80 and Hwy 51. Turn right onto Hwy 51 South. **(Note)** The intersection will be at the top of a hill with a caution light. Travel approximately 15 miles to Hurtsboro, Alabama. In Hurtsboro you will come to the intersection of Hwy 51 and Hwy 26. Cross Hwy 26 onto Main Street. At the end of Main Street turn left at the 4 way stop onto Russell County 49. Travel approximately 7 miles. Turn right onto South Wendy Road (this is a small paved with a deer hunting camp on the side. Mt Missouri Baptist Church will be across the street on the left). **Note** You have gone too far if you come to the intersection of Russell County 4 on the left side of the road. Paved road will dead end into a dirt road (Upshaw Road). Turn right once you are on the dirt road take the first right, (approximately .10 of a mile) through an open gate with a brick road. 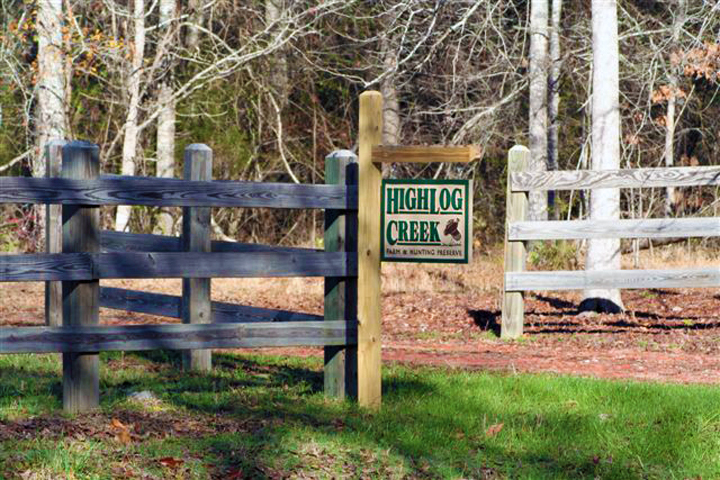 Look for a High Log Creek sign.